Lake Louise is a popular destination in Banff National Park, Alberta, Canada. Lake Louise is one of the most famous Lakes in Canada. Located in the heart of the canadian Rocky Mountains in Banff National Park. lake Louise is a must see tourist attraction when visiting Banff National Park in Alberta, Canada. Lake Louise, Banff National Park, Alberta, Canada, North America. 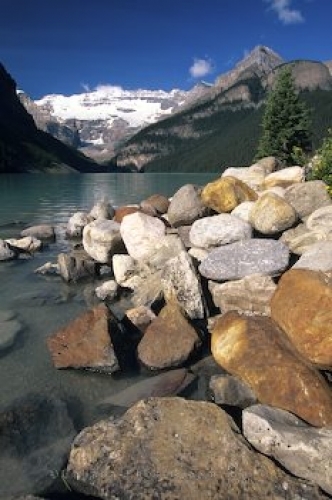 Picture of rocks along the shores of Lake Louise in Banff National Park, Alberta.